In our latest review of this major dynamic microphone article, we decided the models in our chart still stood up to scrutiny and therefore left it as it was! However, we still made several changes to the main article content to bring it up to date for winter 2018. Walk into any studio or glance at any stage, and chances are you will see a dynamic microphone – a key tool in modern audio recording. What are Dynamic Mics Used for? How to Choose the Right Dynamic Mic for You? Due to the way they are made, dynamic mics tend to be more affordable and durable than a condenser mic, as well as offering a couple of other pluses. In today’s article we are going to highlight our favorite dynamic mics, spanning all price ranges, to hopefully inspire you when shopping for a new one! Stick around after the chart, where we will take a look at everything a dynamic mic has to offer producers, performers and engineers. Let’s dive straight into the chart! A combination of rock solid hardware and advanced tech that works great. One of the most versatile dynamic vocal mics currently available out there. Proper studio tool that can serve for both vocal and instrument recording. An extremely versatile piece of gear that is threatening the current favorites. A true workhorse that boast both performance and excellent overall build quality. The worthy upgrade to an already impressive platform that brings many improvements. Stylish vintage aesthetic paired with proper modern performance and rugged build quality. A very solid workhorse microphone that gets the job done very consistently. The go-to choice of professionals and a great value for budget users. A great budget handheld which offers way more than meets the eye. 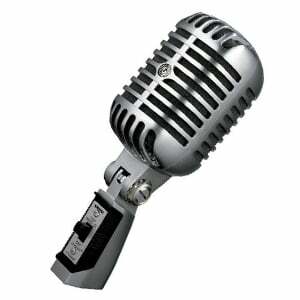 Kicking off this list is a dynamic microphone that is something of a legend in the mic world. Pop into pretty much any radio station in America, and you’ll probably find a few RE20s on the desk! With a distinctive design and heavy-duty build, this higher-end dynamic mic is the king of high-fidelity broadcasting microphones, as we discuss in the full RE20 review. Thanks to solid components and features like the humbucking coil design, this large-diaphragm mic achieves great results with recording vocals as well as different acoustic instruments in a studio environment. A true workhorse! Shure (who you will see a lot of on this list!) may be known for their bulletproof handhelds, but they also offer some niche studio mics that boast an equally impressive performance. In terms of studio recording, their SM7B is one of the finest mics around. With a sturdy all-metal build, this respected multipurpose microphone features solid components, an internal shock mount, and an effective built-in pop filter for exceptional vocal recordings. With a high 180dB max SPL, the SM7B is just as good for recording the most aggressive instruments too. Such a versatile mic! 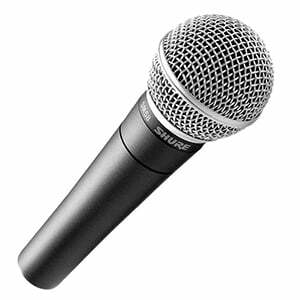 Read more on the Shure SM7B in the complete review. On first glance, the RE320 is deceptively similar to Electro-Voice’s RE20 featured above, although with a stealthy black chassis. 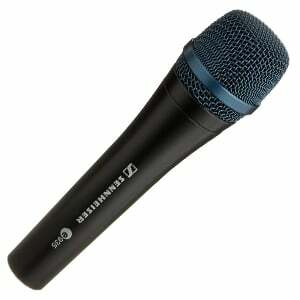 However, there’s more to this mic than simply being a slightly cheaper version of its famous brother! 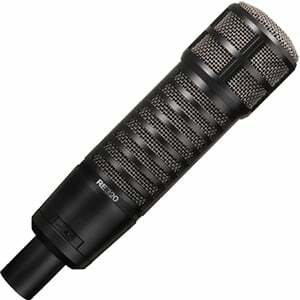 The RE320 is well-respected for essentially being two mics in one – perfect for both vocal recording and as a drum mic. As we highlight in the RE320’s main review, you can flick from a flat frequency response to one that is specifically optimized for instrument recording. Along with the usual high-end components that you expect from Electro-Voice, the RE320 proves great value! Alternatively, you may prefer a blue, or green, or red finish… or yellow, or cherry wood, or even gold! There’s a full rainbow of colors to choose from, as we discuss in the full M80 review. However, it’s more than a pretty face, with a top-notch pro-grade performance for all applications. It features a clean, natural and balanced sound quality and can handle an impressive SPL, making it suitable for instrument use as well as vocals. As we move into the more affordable section of the market, we reach the e935 from the legendary Sennheiser – a no-nonsense handheld stage mic which really cuts through the mix. 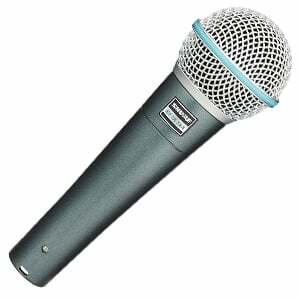 With a fixed cardioid polar pattern and several noise-reducing features, this is a microphone that puts the emphasis on capturing only your voice, as clearly as possible – and it achieves this. It’s also very attractive and features a sturdy all-metal construction – certainly robust and reliable enough for a busy modern stage. You can read more on the Sennheiser e935 in our complete review! Building upon what many consider to be one of the greatest mics ever made (the legendary Shure SM58) the American brand’s successor delivers some tangible upgrades that will turn a few heads. With a familiar but fresher design, the Beta 58A brings a supercardioid polar pattern to the table, as well as a more robust internal suspension system and better overall frequency response. In practical terms, this adds up to a better performance! Could you say the Beta 58A is the SM58 of the future? Read our full review of the Shure Beta 58A to find out our full opinions! With modern mic designs becoming more advanced and… well, modern, it is refreshing to see something like the 55SH Series II from Shure showing off such strong retro looks! For a surprisingly affordable price, this dynamic cardioid mic looks just like something that was yanked out of an Elvis Presley music video, with its cool 1950s design and chrome-finished diecast chassis. Yet, as we mention in the main review of the 55SH Series II, this stand-mounted microphone offers a modern performance, with great clarity and warmth to vocals, and excellent ambient noise-cancelling abilities. Sticking with great-value dynamic mics, one phrase springs to mind when we look at the e835 from Sennheiser – ‘keep it simple, stupid’! As we mention in the full review of the Sennheiser e835, there’s no stupidity in the design of this mic – it’s simple, it’s effective and it does the job of offering an affordable stage-worthy mic. With a cardioid polar pattern and plenty of noise-reducing features, this handheld dynamic mic puts the focus on your voice and nothing else. Unless, of course, you use it to record instruments – and, with a high max SPL of 150dB, that’s certainly doable with this microphone. We arrive at a real legend of the mic world! There’s rarely a bad word said about the Shure SM58 and – if you spend five minutes with it – you’ll know why. As highlighted in the full SM58 review, this mic is nothing special in terms of design, although it does the basics very well, with an all-metal body and strong metal grille providing a sturdy stage partner. And the stage is exactly where you’ll want to be with this reliable handheld mic. It shows off excellent sound quality and versatility, which works well with a variety of voice profiles. A very safe choice! Holding up this top ten chart is the ATR2100-USB from Audio-Technica – a brand known far and wide as one of the best providers of solid gear that won’t break the bank. Unique to this list due to the USB connection, this budget handheld dynamic mic also features an XLR output allowing you to use it on stage. However, as we mention in the full review of the ATR2100-USB, it is much better suited towards all sorts of home recording – especially as it comes with everything you need to start podcasting right out of the box! Let’s start with the basics by taking a look at exactly what a dynamic microphone is! 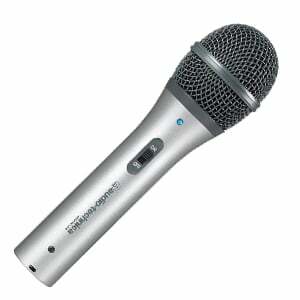 This type of microphone uses electromagnetism to convert sound into an electrical signal that can be used for several applications. In the core of every dynamic mic, you will find three main components: a thin diaphragm, a wire coil and a magnet. In brief, the diaphragm responds to the soundwaves you input (your voice, for example), which in turn move the coil. The magnet picks up the movement of the coil and converts the mechanical movement into an electrical signal. There is plenty more to learn, although that sums it up in its most basic form. Unlike a condenser microphone, dynamic mics are slightly more rugged in their build and cheaper to make, which usually means they are also cheaper to buy. Additionally, they don’t need phantom power or any other power source to operate. Note that, in addition to the moving coil type of dynamic mic we have just described, you will also find ribbon mics. In this style of mic, a thin piece of metal ribbon sits between two magnets. Ribbon mics have a vintage vibe to their sound, making them great for genres like jazz or blues. However, due to their delicate nature, expense and rather niche performance, ribbon mics are nowhere near as mainstream as standard dynamic mics. With this in mind, in the rest of this article we will be referring to the standard moving coil mics when we talk about dynamic microphones. One of the best things about dynamic microphones is the fact that they are so versatile. You can use them in pretty much any kind of environment, and they get the job done. Stage Vocals – Singing live on stage requires a considerable amount of know-how from both the performer and audio engineers backstage. Nailing the right level balance between instruments and vocalists, to allow the latter to cut through the mix, takes both knowledge and proper equipment. However, as the stage is one of the most hostile environments for microphones, a dynamic mic tends to be ideal as they are usually more robust than any other type. In addition, their ability to handle higher sound pressure levels (SPL) means that you don’t have to fret over your volume levels – especially if you are the leadman (or woman) for a metal band! Finally, the fact that they are more affordable is good news, as micing up several vocalists and instruments can soon add up! Studio Instruments – Despite being a key player on stage, dynamic microphones are also often used for several studio applications. For example, recording acoustic instruments and guitar amps in a studio is one of the most popular uses for a dynamic mic. Again, this is largely down to the high SPL – if you are working with loud instruments that create a lot of sound pressure (such as drumkits, bass guitars or brass) dynamic mics are usually the go-to choice. 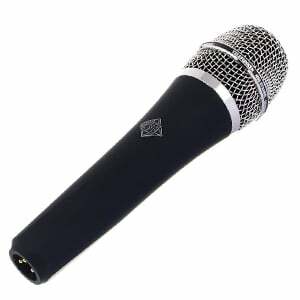 If, however, you are trying to capture subtler details, a quality condenser mic might be a better choice, providing it can handle the increased SPL. Meanwhile, dynamic mics are also very popular for studio broadcasting applications, such as radio stations, podcasting, YouTubing, and voiceover work. They are favorites for live broadcasting for many reasons, although the fact that they are so good at rejecting unwanted ambient noises (such as air conditioning) – which can ruin the quality of a live broadcast – is usually reason enough for most studio engineers. This is one of the most frequently asked questions when people shop for dynamic microphones. Unfortunately, the answer isn’t as easy as just naming a brand and model. You have to answer a couple of questions before you start your search. Firstly, what are intending to do with that microphone – stage or studio work? Are you recording vocals or instruments, or both? How large is your budget? How many mics do you need? Depending on how you answer these questions, you will find that certain models fit you better than others. One term you will undoubtedly run into a lot on your search for the best dynamic mic is ‘polar pattern’. In simple terms, a polar pattern defines the field around the microphone, from which the sound will be picked up. In the context of dynamic mics, there are generally two polar patterns that you should know about: cardioid and supercardioid patterns. Cardioid patterns pick up the sound that comes from the front of the mic, while limiting the sensitivity to sounds coming from other areas around the mic. Cardioid is the standard for dynamic mics because, in most cases, you don’t want noise from behind the mic to be in your recording. Supercardioid patterns are even more focused on the noise coming from the front and do a better job of rejecting off-axis sound. The main disadvantage with a supercardioid pattern is that they tend to be more sensitive to sounds coming from the rear of the mic, which can create issues in a live setting. Depending on the type of application you have in mind, you’ll find that one of these two polar patterns will be the right one. While most professionals will have several different models at their disposal, if you are just starting out, you can’t really go wrong with a standard cardioid pattern, which offers the best performance and the most flexibility. At the end of the day, dynamic microphones are the most versatile piece of gear you can have at your disposal, especially if capturing live audio is your goal. The ten models we have highlighted in the chart above are by far some of the best dynamic mics on the market today, whatever your specific application. All that’s left to do now is to determine your intended use, create a shortlist, read some reviews, then make an informed decision. Good luck!